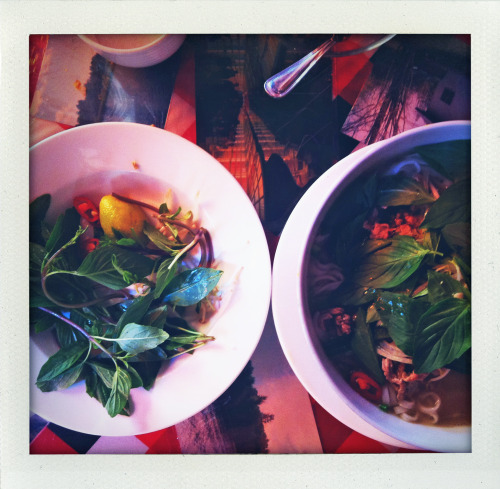 Hungry Ghost Contributor Julian Richards writes in from Saigon. Read his tongue twisting tale of Pho. First morning in Saigon, alone. Asian jet-lag is akin to being forcep-birthed underwater: thoughts percolate but become slurry en route to the mouth. Lips are earthworms, eyes jaundiced lychees webbed with capillaries, moist fish balls. Gerbil tongue. Moss teeth. I slither down the staircase of my one-star on Búi Viện, thin haired, darkly bespectacled and retaining water, like a cheap, hungover Elton John. Out onto the street into a seething pirhana-shoal of motor-scooters. A suety white man perhaps five years my senior is instantly, mercilessly sideswiped a mere 10 feet from where I stand. He goes down hard, flopping like a carp. I turn round and go back into my hotel. The receptionist and her friend look at me gravely. "Phở", they say.